Bobo's here . . . looks like we have some ballplayers. Dear Bobo: While I always turn on the Blues games, as a casual fan it's hard for me to analyze everything that's going on. Could you pick out 5 things for me that help explain how a team that was so awful for the first half of the season could look as great as it looked last night? Or, as great as all the commentators said the team looked? 1) Jordan Binnington is playing confidently in goal. He makes a great save here or there, but mostly he is just quiet in the net, making the saves he should and staying under control. 2) Given that, the team is more settled in the defensive zone. Binnington's confidence makes them more confident. They aren't chasing around as much because the goaltender isn't thrashing around as much. 3) Individual D-men are better. Jay Bouwmeester got better as his recovering from hip surgery progressed. Carl Gunnarsson played very well when he finally escaped the injured list. Robert Bortuzzo also provided a lift when he got well. Consultant Larry Robinson did some good work with Colton Parayko when he came down to the ice. 4) Craig Berube is a straightforward coach. And it took some fourth-liners (Oskar Sundvist, Ivan Barbashev) and some fill-ins from San Antonio (Nolan, MacEachern) stepping up to play a more direct game to help drive that home. 5) Vladimir Tarasenko finally regained some of his old swagger. He is scoring some goals and making some nice passes. I attended the Blues/Lightning game last night....the Blues played as well as I have ever seen them. I don’t know if this was the case of the Blues being that good or the Lightning playing well below their normal game. Don’t get me wrong, Binner bailed them out numerous times but that’s what your goalie is supposed to do. But I can see a budding confidence in our boys that can take them far provided Binner keeps playing well. Chief....Go with Binner, he’s a winner! Berube has made it very clear that he will ride the hot hand. Jake Allen will play here and there with some back-to-back games coming up, but this is Binnington's chance to grab the job and go with it. In a strang year for goaltenders, he is one of the most surprising stories. So, the only two Rams games I watched this season were the NFC championship against the Saints, and the Super Bowl against the Patriots. My question is about Jared Goff: what am I missing? He gets hyped as some kind of wunderkind, but he looked lousy against the Saints, and much worse against New England. Did he spend too much time with Jeff Fisher? He's a talented guy. He has a tremendous arm. Look at the overall numbers for the season. The Patriots made him look bad. That's what happens when Bill Belichick has two weeks to get ready for you. The Patriots threw a lot of stuff at the Rams that they were not ready for and their coaching staff did not adjust quickly enough. So that was just like the last time the franchises played each other in the Super Bowl. Tom Brady wins his sixth Super Bowl, which is the all-time record for a player. My question is, what will happen first: another player wins six Super Bowls, or the Blues win one Stanley Cup? If you picked the latter, then you're a homer. If Brady refuses to quit, maybe other Patriots get to six. Once this Brady/Belichick/Patriots run end, I don't know that we'll ever see another player win six Super Bowls. Maybe the industry will change, but right now it's set up for parity and New England is the only franchise that defied that. No other franchise has come close. As for the Blues and the Stanley Cup, there is nothing magical keeping it from happening. They could get into the playoffs this season, catch fire, get better and better and actually win the thing when you least expect it. Or they could fade in the regular season and miss the bracket. Winning the Cup can be a pretty random thing. So at some point their number will come up on the roulette wheel. I pick the Blues, not being a homer but just looking at probabilities in the Oost-Brady Era. Man that was a fun game against TB last night. What were your impressions watching the Blues take on the best team in the NHL right now? The Blues proved what I said all along -- that this team has more talent than most teams in the league. That's how the team played at the start of last season. The only surprise is that it took about half of the season for the Blues to start resembling the team that started so well last season. Is Jordan Bennington the long term solution in goal for the Blues? Do you think Allen is wearing a Blues jersey at the start of the season next year? Will Husso get a shot to be in a tandem pairing with Binnington? Husso's season became a wash because of injury, so he can look forward to more AHL team. In today's NHL there are few long-term solutions and lots and lots of questions. Right now it appears you will see a Binnington/Allen tandem next season because that makes sense from the contract standpoint. The only exciting potential free agent is Sergei Bobrovsky and he will maximum dollars and years. I don't see the Blues taking that gamble on those terms. If the Blues continue this streak and make the playoffs does the Blues front office think about extending Berube? Sure. The Chief earned management's respect with his work as an AHL head coach. His previous NHL coaching experience served him well. It took a while, but the team is responding to him. If the team keeps improving -- and it still has a lot more to give -- then Doug Armstrong needs to consider that strongly. I could see the postseason ban going away. Otherwise the NCAA will take a months-long flogging for punishing the 2019 team for stuff that happened under a previous administration. Mizzou figures to be good enough to keep the issue in the forefront and you have to believe the SEC will back the team given its potential. What are your opinions on the potential rule changes recently proposed by the MLB and MLBPA (DH, pitch clock, 3 batter min, incentivse winning/penalize losing)? I've softened my position against the DH, although I still prefer NL-style ball. Since teams don't know how to play small ball well, maybe it's just time to move on. Pitch clock? Fine. Do it. I do not enjoy watching a man stand on the rubber pondering life's mysteries instead of throwing the ball. If the guy doesn't know what to do, he should not be out. If he is afraid to make the pitch, he should not be out there. As for rewarded consistent relevancy, sure, do that too. This tank-and-rebuild thing is fun great for general managers -- it gives them three or four years of grace time -- but it is very hard on the fan base. In your opinion should Mo and Girsch be more open to the idea of siging Harper? It is obvious the fan base would welcome a “go for the jugular” type of move to make us the odds on favorite in the NL Central. I believe the executives are quite open to signing Bryce Harper. They would love to add talent. But I'm also sure that Bill DeWitt Jr. is not open to paying Harper $30 million-plus per season while also paying Dexter Fowler almost $50 million to either not play the next three seasons or go away entirely. In a time when the NBA is dominating headlines with players requesting trades, busy trade deadline deals, and established marketable stars: what can the MLB do to emulate some of the things the NBA is doing right. The MLB is at a crossroads in my opinion. There are less superstars in the sport than ever before, their offseason has become this long drawn out process that causes fans to lose interest, and players are unhappy with the process and the contracts being offered. And it looks like a labor strike is on the way. What needs to happen to right the ship in your opinion? Let's face it, the NBA only has a few relevant teams. Is that the model MLB wants? NBA teams make crazy teams, superstars hold GMs hostage, superstars do their own recruiting and team-building . . . I don't know that it's so great in that league. James Harden can score 70 a night and the Rockets aren't relevant. The Greek Freak can be, well, a freak and the Bucks aren't relevant. Russell Westbrook and put up quintuple doubles 82 times a year . . . and so what. The athleticism is crazy and it's a nice show, but most fans in most cities know there team has no chance. On the other hand, MLB is painfully dull. MLB needs to pump up stars, as the NBA has done, and also have them do more athletic things. Right now baseball features two activities: Hitters taking a pitch or hitters trying to lift a fly ball over a fence. That's it. Right now baseball is a boring as Pat Riley's old Knicks teams in the NBA. 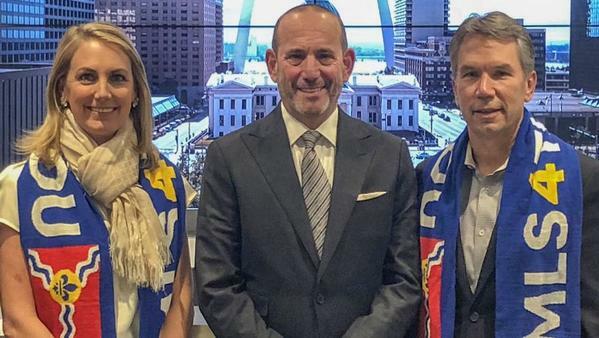 I haven’t heard many updates about the movement to bring the MLS to St. Louis. Any updates on that front? stltoday.comAs of today, the St. Louis bid lacks key sponsorship commitments for the stadium and the front of the team uniform, a marquee spot in soccer. And MLS is watching. The Bucks are the top seed in the East. How are they not relevant? Do you really think they can win a title? They have arguably the best player, but the championships have come down to the Warriors vs. LeBron for some time now. I know I am using hyperbole here -- maybe I'm just disappointed Boston didn't automatically become the scourge of the East -- but I would like to see that league go into postseason play with an open field. What is your level of interest in the XFL coming to St. Louis? Limited. Chat regulars know that I'm a skeptic of new leagues after four decades. The fact that we have wannabe start-up football leagues only adds to my skepticism. What is your favorite micro-brewery to visit in St. Louis or the surrounding area? Wrong guy to ask there. I am not much into the fancy beers. In the NBA, they say some guys are a "volume scorer." That means they just keep hiking up shots until some go in. I would rank as a volume consumer when it comes to beer. That said, I won't go into Urban Chestnut and order a Bud Select, if you can even do that legally. I asked Derrick the same question but I’m curious to see your answer as well. What are your top 3 favorite sports movies of all time? Tough one, of course. "Miracle" was an absolute classic. I have a weepy side, so shout out to "Field of Dreams." I'll go off the grid a bit and say "The Wrestler" as well. Depressing as hell, but a low-budget marvel with Mickey Rourke. Loved "Tin Cup" and "Remember the Titans" and others, along with the epic "Raging Bull". Favorite Cardinal alum to talk baseball with? Bob Gibson doesn't know me from Adam, but when he gets on a roll with a Mike Shannon or a Tim McCarver, that is solid gold. Growing up in the Detroit area, what Tiger baseball players were your favorites? Watching these NBA players whine about everything -- LeBron doesn't like random players getting traded, Durant hates the media, Anthony Davis wants out of New Orleans two years before his contract extension ends, Kyrie Irving with a new, stupid idea every day -- has gotten really tiresome. Is the NBA management structure completely out of whack, or is this just Whiny Millenials Being Whiny? The superstars run that look. And for them, because they have earned that right. Their talent is crazy and the top guys play at 100 miles per hour. (No, Carmelo Anthony, you are not a top guy.) That said, I can't imagine being a fan of one of the 25 or so teams where guys don't want to play. Every night, Le Bron James is eyeballing guys on your team's roster, wondering who he can recruit to LA. Yo Gordo, Hochman offered up his "five Cardinals concerns" going into spring training. Deep question here: What are your five (or more) concerns about that team? 1) Relief pitching. I say it every week, this team should add one more lock-down veteran. And it can not afford to hid a guy in the back of the bullpen because he is owed big money. Either the guy can pitch or he can't. Enough. 2) Dexter Fowler. Until he proves otherwise, he is nearly $50 million in dead money clogging up the long-term payroll and handcuffing the management team. 3) Matt Carpenter. Had a bad shoulder, now he is taking lots of work at third base to be acceptable there defensively. Will that equal more shoulder trouble? What will that do to him at the plate? And as he ages, will he be prone to more weeks-long slumps. 4) Paul DeJong. He is a very good young player, but is the team expecting too much from him? 5) Adam Wainwright. One of the all-time good guys. Nobody wants to see things end badly for him this season.